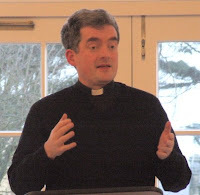 Fr Hugh MacKenzie introduced the next theme with a lecture on the subject "Why do we need a new Catholic realism?" This dealt particularly with the age-old problem of universals, discussing the origins of the question in Plato and Aristotle and the approaches of St Thomas, Duns Scotus and the nominalists. Essentially, the problem for us today is that the scientific account of material things leaves us with a number of possible levels at which a thing can be a universal in one respect and a particular in respect to something that is organised at a "higher" level. An important concept which helps to avoid a modern form of nominalism is the analogy of being according to which things participate in being to a greater of lesser degree. We are also faced, I think, with the question of the relationship between language and concepts. Here, it would be helpful to address some of the questions raised in modern philosophy, particularly by Wittgenstein. The important thing is that language is the means by which we communicate our knowledge in relationship with each other; and language has also developed in sophistication as the need to express philosophical concepts has itself developed. This session was perhaps the most difficult of the week in terms of pure philosophy. However, we were also challenged by presentations from two quite different areas of doctoral research. More about that tomorrow.